Global firms agree social media presence brings in new business, resulting in higher revenue. NEW YORK (TheStreet) -- A growing number of global firms agree social media presence brings in new business, resulting in higher revenue and profit. According to a survey last week by Regus, a firm that provides workplace solutions such as meeting rooms and video communication studios, 47% of firms surveyed said they use the strategy to find new business, an increase of 7% from last year. "As businesses emerge from the downturn, they are increasingly reconsidering pre-recession working practices and opting for more flexible, competitive strategies," says Sande Golgart, a regional vice president for Regus. "More and more companies are leveraging social media to increase the loyalty of existing customers and as a successful acquisition tool." Businesses in China and India are leaders in using social media to attract customers, according to the report, published Wednesday. Approximately 65% of Chinese firms (vs. 44% last year) and 61% of Indian companies (vs. 52%) successfully use social media to acquire customers, the report says. Businesses in the Netherlands and Mexico round out the top four countries most acclimated to social media for business purposes. Approximately 43% of U.S. firms (vs. 35% a year earlier) use social media to gain customers, the report says, implying there is much room for growth. Half of the U.S. firms surveyed said they used sites such as Twitter to engage customers. 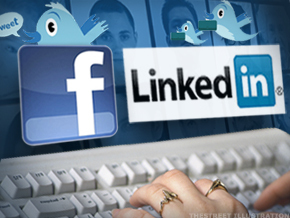 More than half of those companies also encourage employees to join professional social media sites such as LinkedIn ( LNKD. In the U.S., 11% more companies that used social networks to acquire customers experienced a rise in revenue in the past year vs. those that didn't use social media, the report says. The survey asked more than 17,000 senior managers and business owners globally about their use of business social networking. Social networking, including Facebook, Twitter, LinkedIn, China's Renren and Orkut in Brazil and India, is a growing part of businesses marketing strategy. This year 34% of companies devoted a marketing budget to the strategy, compared with 27% last year. And more than a third plan to devote more of their marketing budget to social media. Approximately 39% of respondents devote up to 20% of their marketing budget to social media, the report states. Still, 34% of respondents still have no budget for social networking, the report found.